Another aspect of our drive for continuous improvement is using the latest computer systems to manage our business. In today¹s business environment, this is just as important to customers as having the right die casting equipment. To make sure we have the right systems in place, we have completed a computer software upgrade that integrates everything from scheduling to order tracking and quality control. The software was developed specifically for the die casting industry by experts who understand today¹s demanding business requirements. The software package has been refined over many years to ensure reliable performance, and all data is backed up offsite to guarantee no critical data is lost. The new software ensures that pertinent information is just a click away, allowing us to maintain better management control of all processes while providing faster response to customers. For example, the new scheduling module confirms that all the resources needed for on-time delivery of a quality product are in place when we need them. The system allows us to schedule by metal type, die size, weight, production run size and similar factors. It includes a powerful drag and drop schedule board to quickly communicate with our production departments and our customers. Once a job is scheduled, the shop floor manager module uses a fully integrated data collection system to track production progress in real time. Using bar coding and touch screen technology, the module tracks order status and quality so we can make sure that we always meet our customer¹s specifications and delivery dates. The module is particularly valuable in helping us make any adjustments for last minute changes, such as expedited processing, quantity changes or tooling modifications. The quality module complements these two systems with customized reports that integrate purchasing and production requirements. For instance, each individual customer¹s certification needs are stored electronically and can be transmitted at a moment¹s notice. Lot control from our suppliers is also readily accessible. The system provides easy access to a variety of supplier data, including material type, date of manufacture or other specifications. The tooling module is another important component in our ongoing quality management program. This module allows us to track the actual number of shots on each tool daily. It also gives us the ability to set specific parameters for when to pull the tool for preventive maintenance or when to ³stress temper² the cavities to extend the productive life of the tool. Tracking tooling use also prevents interruptions if replacement tooling is needed. Using the guidelines for maximum tool life, new tooling can be built, sampled and ready for production without any workflow stoppages. Another advantage of the computer upgrade is that we can produce custom reports to electronically send each customer a current material price list. 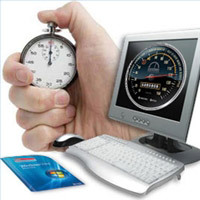 The speed, accuracy and management control provided by the computer upgrade make the investment well worth the money. It helps us manage more effectively while providing better service and quality components to our customers.